*This post summarizes a report prepared by the Nantucket Conservation Foundation. Read the full report here. The landscape at the southern end of Hither Creek, in a place once called Millie’s Pond, has become dramatically different in the last year and half. The Halloween storm of 2017 permanently altered this iconic piece of Nantucket. Take a drive on down this weekend and marvel at what change a single storm can bring to our coastlines on Nantucket. the southern end of Hither Creek, past Millie’s Bridge, consisted of a deep almost circular salt pond (Millie’s Pond) surrounded on three sides by well-established salt marsh, shrub wetland, and coastal shrubs (Image above). Following the storm, sand from the eroded dune was displaced onto the salt marsh and filled in a significant portion of Millie’s Pond. Once the storm subsided, the overwash ceased and normal tidal water flows connecting Hither Creek to Madaket Harbor resumed. While Millie’s Bridge itself remains stable, the vegetated coastal wetland, salt marshes, dune and coastal pond were all completely changed, buried under up to 2 meters of sand in some spots. Science staff from the Nantucket Conservation Foundation wanted to understand how the massive amount of sand would impact salt marshes and shrubby wetlands surrounding the Pond – or what was left of the Pond! For the past year and a half we have been monitoring sand extent and vegetation growth within the new sand dune. 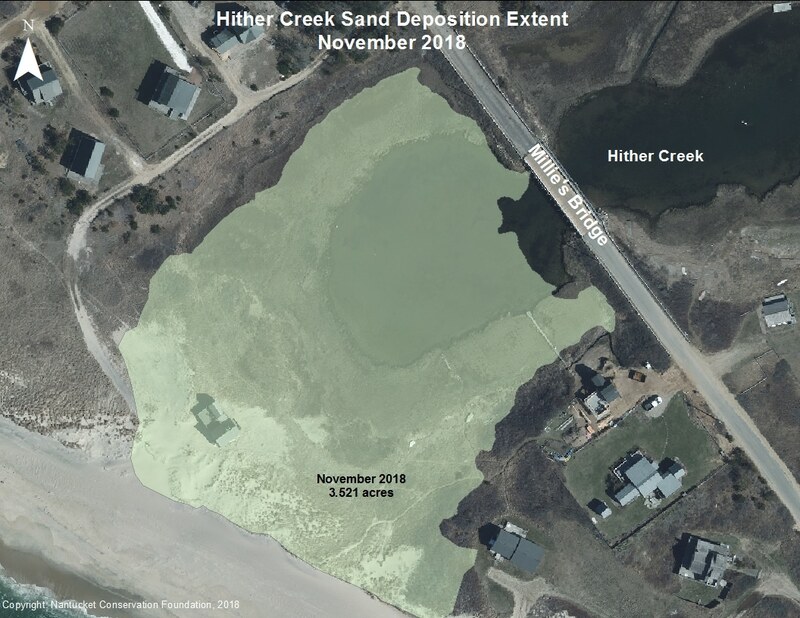 Immediately following the Halloween 2017 Storm, we measured the area newly covered by sand from the top of the previous dune to the edge of the Pond – 2.2 acres of new, exposed sand dune had been created (image below). Tan color represents the new sand covering previous shrubby wetland, salt marsh and open water at Hither Creek in Nov 2017. 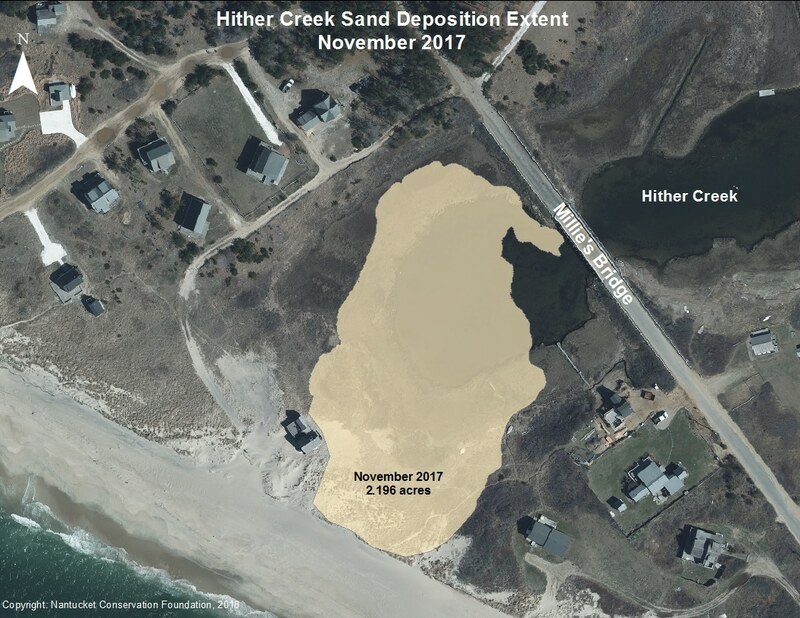 Through settling, erosion and further washover events in the winter of 2018, the sand advanced further into the pond and on top of surrounding salt marshes. 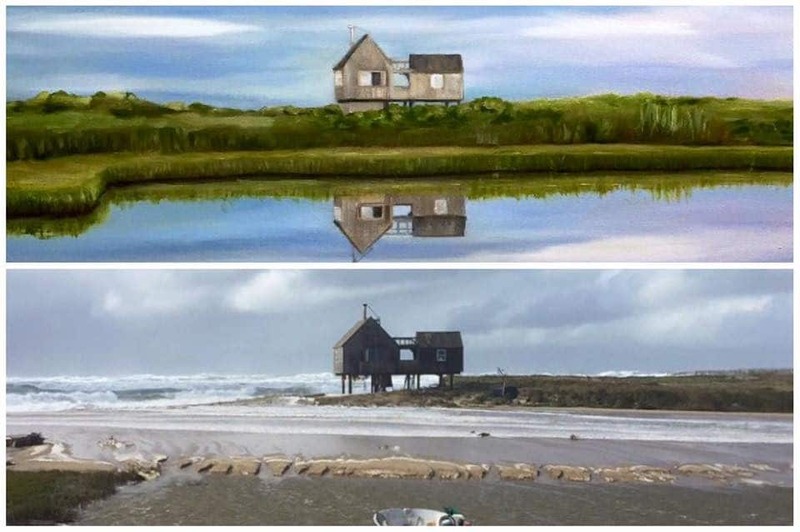 One year after the first storm, the new sand flat was 3.5 acres in size with the majority of salt marsh buried and the iconic Stilt House removed due to erosion (image below). Once year after the initial storm, the sand (green) cover 3.5 acres at Hither Creek. The initial Storm buried a significant amount of vegetation and continued to advance into the pond and across the salt marshes. By the summer of 2018, none of the shrubby wetlands around the pond were able to grow up through the sand. Additionally, only a few small patches of salt marsh survived and grew up through the sand (image below – June 2018). 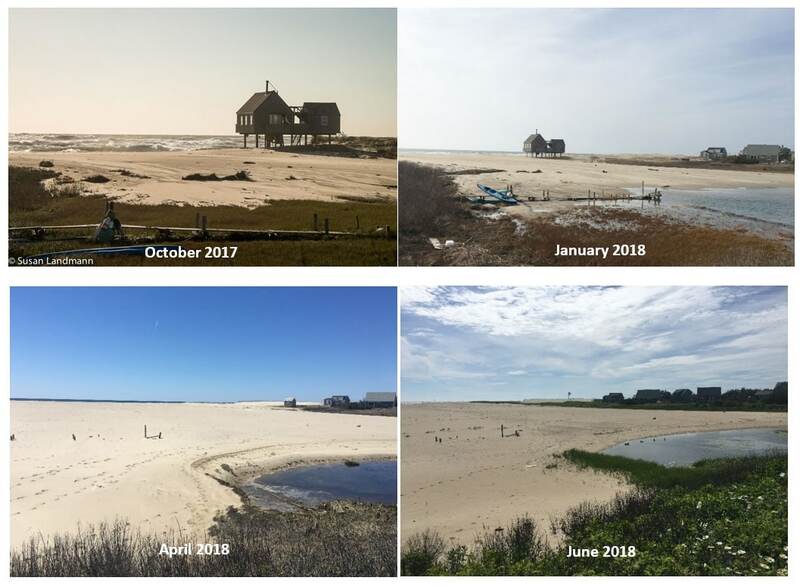 Photos taken from approximately the same spot on the eastern end of Millie’s Bridge showing changes in sand extent, loss of the Stilt House and salt marsh vegetation over time (photo credit to Susan Landmann for the Oct 2017 photo). For the most part, the plants and wetlands that existed prior to the storm have been erased. Now Nature needs to begin building new plant communities onto the bare sand. In summer 2018, we did see many new plants moving in – obviously brought in on high tides. American beachgrass, groundsel, high tide bush and seaside sandmat were abundant on the exposed sand. And, excitingly, we found an abundant population of a state-listed plant of special concern that loves exposed sand – the seaside knotweed established and even set seed, hopefully to keep growing and expanding next year! What Will the Future Bring for Millie’s Pond? The fate of this area will depend, in large part, on the cycle and intensity of winter season storms over the next five years. The buried wetlands that once ringed the pond did not survive but new plants moved in and began growing. Hopefully, given time, the exposed sand will become vegetated and stabilize the sand dune and buffer surrounding areas from future high tide events. Will future storm events breach Hither Creek and threaten Millie’s Bridge? We can’t say no for certain but right now it doesn’t look likely. Sand fencing installed on the sand dune has allowed that to accumulate and build in elevation. The more vegetation that grows on the sand, the more stabilized it becomes. Reducing impacts to the sand by limiting foot traffic and vehicle access will go a long way to protecting this area. Although the exposed sand is a dramatically different habitat than previously observed at the end of Hither Creek, observations over a year showed that a lot of ecological activity took place within the impacted area. The sand provided habitat for many shorebirds, even a pair of piping plovers, as well as fiddler crabs and a rare plant species. Horseshoe crabs very actively used the sand for feeding, mating and nesting at high tides. Given time, this habitat may prove as valuable and hopefully as aesthetically pleasing as what was present before. The Nantucket Conservation Foundation is a private, non-profit land trust that depends on contributions from our members to support our science projects, conservation property acquisitions and land management efforts. If you are not already a member, please join us now!